JVC claims that the speaker ships with 500 Watt PMPO which delivers balanced output and its 4-inch subwoofer packs "the loudest sound possible." Expanding its 2.1 Speaker range, Japanese electronics company JVC has launched XS-XN21 speakers at a price of Rs 5999 in India. JVC claims that its 4-inch subwoofer packs the loudest sound possible and produces 16W of thumping sound. 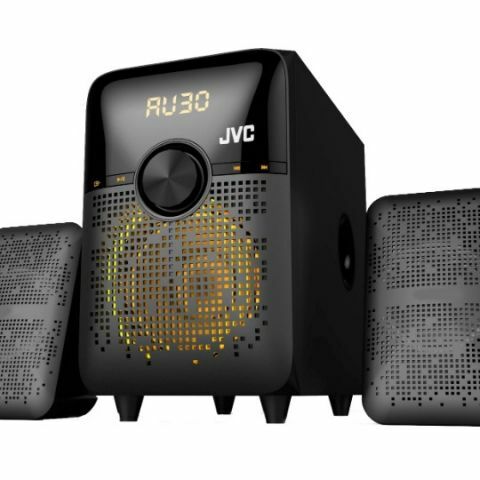 JVC, the Japanese brand that has entered India with Veira Group (one of the largest OEM for Consumer Durables in India) announced its newest 2.1 home audio speaker range ‘XS-XN21’ loaded with powerful sound drivers and effective audio technology, for an incredible sound experience in your living room. The speaker is armed with cutting edge sound technology that offers an immersive audio experience with dramatic styling and unique LED lights. Check the track’s details, volume or adjustments, on the bright LED screen embedded in the speaker. Boasting the powerful clarity of sound with 500 Watt PMPO the speaker brings an edgy roughness balanced with style. The 4” subwoofer system packs the loudest sound possible. The speaker produces thumping sound with 16W of output power that makes it your top-most music system. Designed to enhance your every experience the speaker takes the listening to the next level. The speaker connects to smartphone, laptops or smart TVs with the inbuilt Bluetooth feature. User could also connect the USB devices, or SD card, to play the songs from any storage space. In addition, the AUX allows direct connect to the speaker. So enjoy every moment, with the multitude of functions. Featuring great looks and greater performance, the speaker comes with inbuilt FM Radio function. Adjust the volume, change the track or operate the speaker from anywhere across the room; with the remote control console, the power to operate the speaker is in users hands. This product is currently available online with www.flipkart.com and leading retail stores in India. Which 2.1 speaker to buy in range of 1.2k-1.5k ? Looking for 2.1 speaker system for my IBM T430 laptop. Please Suggest.